A newlywed couple were in the midst of unsuccessful fertility treatments at a nearby center during the time of the Oklahoma City bombing which occurred at 9:02 am on April 19, 1995. The personal heartbreak and simultaneous loss of 15 children at the day care center in the Alfred P. Murrah Federal Building and its aftermath set a sorrowful resonating tone of great sadness, acceptance, and getting o… n with life for the veteran marathon runner and his wife. That is, until the Boston Marathon bombings on April 15, 2013.The clock at the nish line during the first explosion reminded him of his rst marathon time of 4:09 and something seconds in 1990. That Hey You moment coupled with the death of an eight-year-old boy near the nish line and a very close date of the Oklahoma City bombing reignited long dormant reactions and emotions of 1995 and earlier life events. 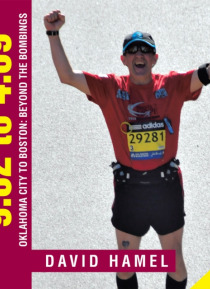 Thus began a passionate journey to reclaim the Boston and Oklahoma City Memorial Marathon nish lines in 2014 and 2016. This is the story of an Air Force Sergeant and his wife, teddy bears and the babies that werent to be and of letting go.